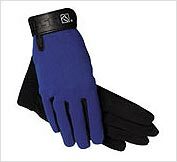 The most popular all weather glove worldwide! Wears like iron, easy to wash. Colorfast, durable absorbent soft Aquasuede Plus palm. These have a strong elasticized back for a cool comfortable fit with a hook and loop closure. Use for schooling, endurance, hacking, barrel racing, carriage driving, race riding or driving.